Lake Oswego Skunk Control is able to remove skunks that are living under your house, deck, out buildings, or any other place on your property. We have years of experience with solving these problems and preventing future problems. Once the skunks have been removed from the property the next step is to properly seal up the area that they were getting into along with any other potential problem areas. When trapping skunks the hardest part is not getting them into the trap, but it is removing the trap and not getting sprayed. Skunks are very good at digging and live in burrows which is why they commonly dig under houses. Skunk's are actually very calm animals that keep to themselves, but if you ever see a skunk acting weird, such as out during the day, patches of hair missing from its body, or foaming at the mouth. These signs could mean the critter is sick and needs to be removed by a professional to not put others at risk. Skunk trapping in Lake Oswego is the best way to remove skunks from under your house or shed. We use a special type of trap that allows the skunk to get in and not spray. 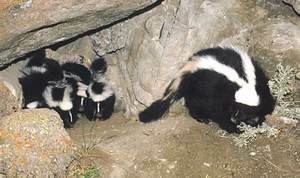 We very rarely have a skunk spray in LO, but when they do it is because of a pet or another animal. Trapping a skunk requires skill and experience to make sure nobody gets sprayed or hurt. In some cases we have to use cage traps because of the location, but in most cases we use an enclosed skunk trap. In Lake Oswego you can find many beautiful nature and wooded areas. These are great for walks or picnics, but they also are a breeding ground for skunks. 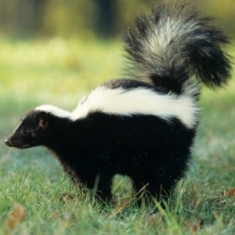 When a skunk is forced to spray and is living in or near your property it can cause a real stink! We have a food grade deodorizer that can remove the odor and is pet/children safe. We are able to go into houses, under houses, and even in out buildings to remove the odor. If left alone skunk smell can stay around for months and really get into clothes and furniture. When you have a strong skunk odor in your house there is a good chance that you might have skunk's living under the house. We have been removing skunk's under houses in Lake Oswego, Oregon for many years and can quickly solve your problem. The most important thing to do is not seal the skunk under the house because this might trap the animal and cause him too die under there. Dog sprayed by a skunk.